Are they moving into Lord of the Dance Pose or out of it? If you're looking for tips for advanced yoga postures, the main point to keep in mind is to ease into intermediate or advanced poses by first listening to your body. There are so many wonderful postures in yoga. Each one provides benefits for whole body and mind wellness. When we see the beautiful pictures of yogis and yoginis in amazing postures, they peak our desire to perform at those levels. "Pretzel positions" do not come easily. Even experienced instructors will tell you that they balance better on one side than the other, or have challenges that require them to modify certain postures. Baron Baptiste, founder of Power Yoga, is quoted as saying that every time he'd try to wrap his foot around his ankle in Eagle Pose, he'd fall! It took him quite a while to master that posture. It's also helpful to remember that yoga is not simply about the physical component. The union of body, mind, and spirit propels your yogi journey far beyond anything you can imagine now. Each level of yoga you attain is an accomplishment, so even if you're not able to sustain Eight-Angle Pose very well, you'll still create a satisfying experience. Another tip for advanced yoga postures is to practice form repeatedly before finalizing the posture. For example, if your regular yoga class doesn't include Supported Headstand and you're curious about it, ask your instructor for some additional time to go over the steps of the pose. Practice each step just before the final ascent with your instructor and at home against the wall so you feel fluid and comfortable. Then, practice the ascent under the instructor's guidance until you feel confident you can do it alone-and away from the wall. 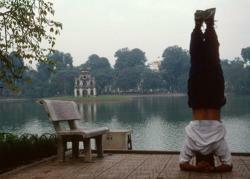 Practice all the moves for Supported Headstand leading up to your final ascent. On the Yoga Journal Web site, you'll find many postures are listed with preparatory pose suggestions. This recommended sequencing is another good way to perform advanced yoga poses. Using Supported Headstand as an example again, Yoga Journal suggests Downward Facing Dog and Supported Shoulderstand as preparatory poses. If you're not always able to meet with your instructor, ask a more advanced practitioner to spot you for certain poses. 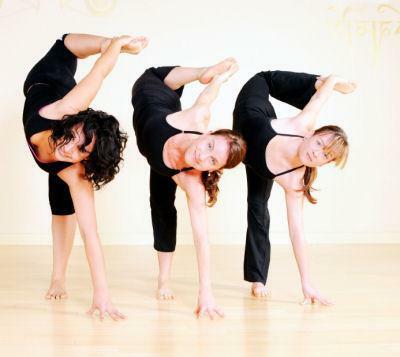 For example, most people can get into Wheel Pose fairly easily. But, getting out of it can be a real conundrum! A buddy can help you avoid injury by repositioning your feet so they don't flare outward and help you broaden your shoulders. When you're ready to release, your buddy can position their hands under your back to guide you to the floor as you release your arms and legs. Wheel, also known as Upward Bow, can be mastered with guidance. There are many terrific yoga books with detailed, step-by-step photographs and clear instruction. If you have an intermediate ability of yoga, you'll find many of these books contain just enough advanced poses to keep you engaged for quite some time. It's not always good to practice advanced yoga poses from DVDs. It's harder to correct your form and you don't get the feedback you need to improve. However, you can use DVDs and even online yoga routines to study form and transitional postures so you gain a better understanding of the posture.